The many types of salvias are colorful, reliable flowering plants at home in most parts of the country. Members of this clan, which includes the culinary herb, sage, have square stems, flowers whorled around upright spikes, and bright colored blooms in common. One of the most popular is Red Salvia, also sometimes called Scarlet Sage. It is a valuable addition to yards and gardens, blooming generously and needing little care. A native of Brazil, this type of salvia is commonly grown as an annual most places because it is not hardy enough to withstand the winter cold north of Florida, South Texas or Southern California (zones 9, 10). Extremely frost sensitive, red salvia cannot tolerate temperatures below 32°F. Red salvia plants typically grow 1 to 3 feet tall, although they are capable of growing to 8 feet in regions where they are not killed by frost each fall and grow as perennials year round. 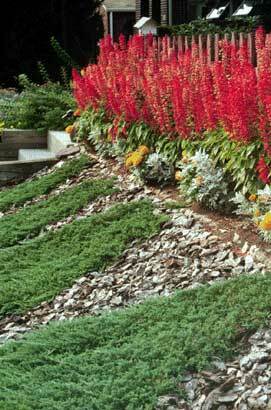 Annual red salvia will become 12 to 15 inches across as it branches out and matures over the summer. There are some dwarf kinds that grow only 10 inches tall, and medium types that average 12 to 16 inches in height. The foliage of red salvia is medium to dark green. Individual leaves are ovalish, usually about 3 inches long, and their edges are slightly toothed. They grow in pairs opposite each other along the stems. 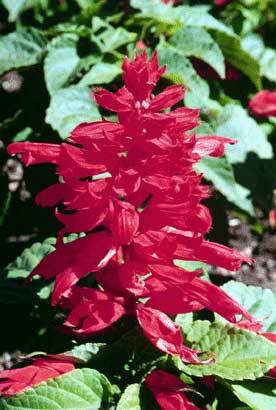 Red salvia flowers are usually bright red, although there are some that are purple, pink, or cream colored. They grow in circular clusters around spikes which rise 8 inches or more above the foliage. Each tiny flower is 1 1/2 to 2 inches long, sort of tube-like in shape. They bloom from early summer up until first frost. They have no fragrance.